Born in 1899, Lucio Fontana was an artistic child of the early 20th century: after being classically trained as a sculptor in his father's studio, he experimented with the major movements of his youth, including Cubism, Futurism, and Surrealism, as he became a painter. But Fontana's mature work would not be associated with the methods or aesthetics of any of these conceptual schools, for unlike the brash young geniuses who created these movements, Fontana was a late bloomer, an experimental seeker who worked slowly and patiently toward aesthetic goals. A full-scale retrospective exhibition of his work, currently on display at the Musee d'Art Moderne de la Ville de Paris, demonstrates both the complexity of his development and the consistent beauty of his work. 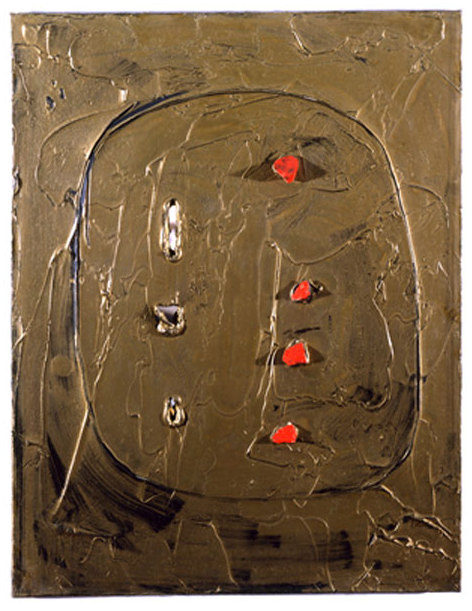 Lucio Fontana, Concetto Spaziale: Venezia D'Oro (1961). Throughout his career, Fontana insisted that he did not make conventional art works - paintings or sculptures - but what he called spatial concepts, a term he may have borrowed from the Futurists, who wanted to create new artistic forms that portrayed the beauty of speed and movement. 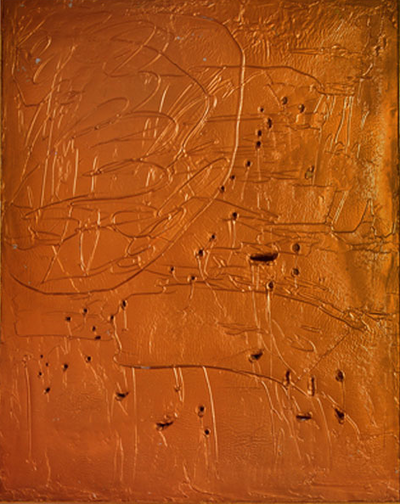 Whatever the genre names given to Fontana's works, his art consistently reflected his early training as a sculptor in his strong tactile sense, and also consistently showed his love of color. Fontana's unerring aesthetic sensibility made him almost incapable of producing art that was not beautiful. Lucio Fontana, Concetto Spaziale: La Fine di Dio (ca. 1963). The retrospective exhibition documents Fontana's evolution, through his experiments with Surrealist-inspired abstractions to his first distinctively innovative works in 1949, that he called buchi (holes), for the perforations he made in canvases that were otherwise blank. 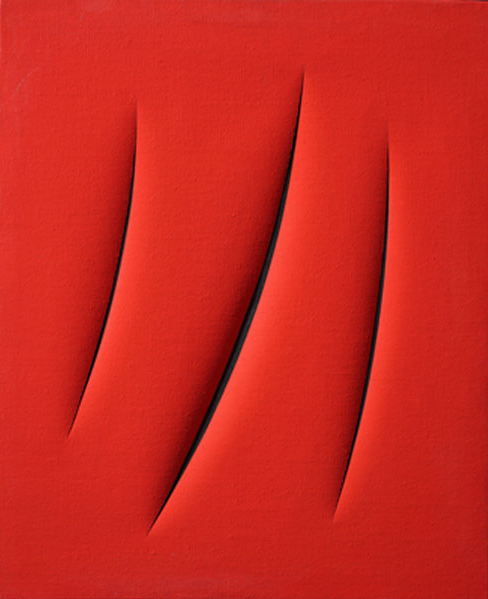 A decade later, beginning in the late 1950s, Fontana began to make the works for which he became famous, the tagli (cuts), in which he made long incisions into canvases that were normally painted a single color. The tagli might have a single cut, or a series of roughly parallel slices. Fontana's wonderful aesthetic sense gave the tagli elegant rhythms of incisions, with beautifully colored backgrounds, often subtly nuanced. Each of these paintings was distinctly different from the others, even though they shared a common method of construction. Throughout his 50s and 60s, Fontana produced masterpieces of form and color, one after another: he never lost his strong visual imagination, and his superb sense of form. 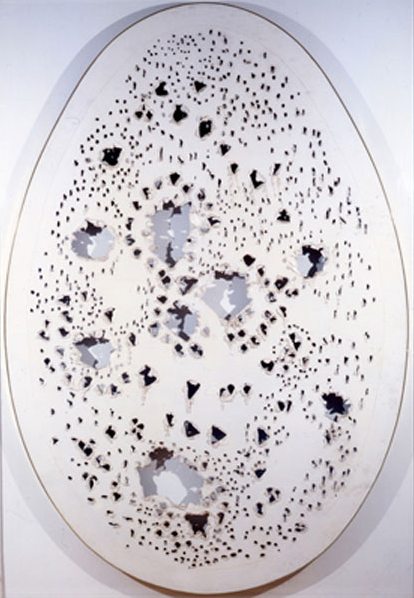 Lucio Fontana, Concetto Spaziale (ca. ~1961). Fontana was a great visual artist. Like the Abstract Expressionists and the Tachistes, he spent long periods looking at his work in progress: he once remarked, "When I'm sitting in front of one of my cuts, contemplating it, I suddenly feel a great revelation of the spirit." 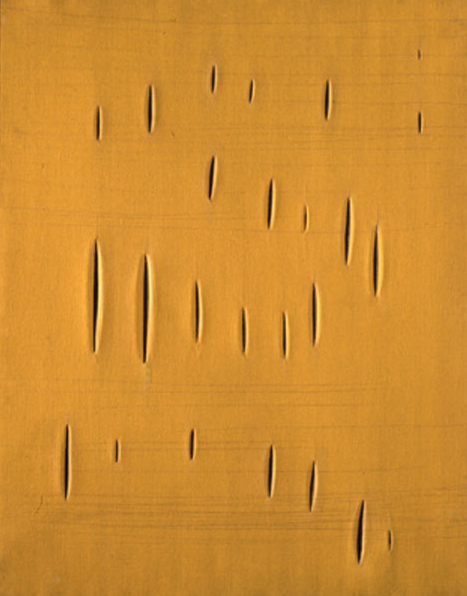 Viewers can experience the same feeling, as Fontana's mature works take us into a beautiful, timeless expanse. 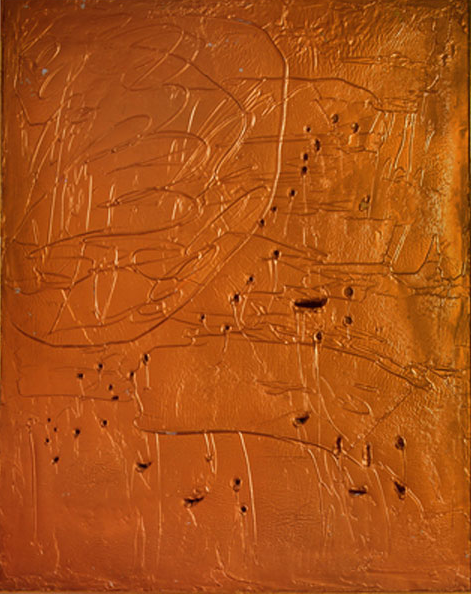 Lucio Fontana, Concetto Spaziale (1959). Like many other artistic and scientific innovators of the 20th century, Lucio Fontana was fascinated by the exploration of the cosmos, and his work consistently evokes the mysteries of space. His approach was always visual and experimental, rather than theoretical and conceptual, and this is what makes the trajectory of his career both fascinating and exciting, for his forms were always imprecise and elusive, uncertain images that represented a search for a distant visual realization. 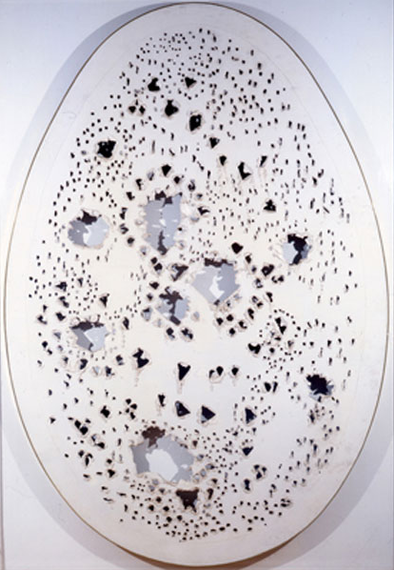 For Fontana, cutting the surface of a painting was a constructive gesture, that opened up his art to dimensions of time and space; much like the art of Jackson Pollock, that invited the viewer to imagine the work extending to infinity on the same plane as the canvas, Fontana's perforations allow the viewer to imagine the work extending forward and backward in space from the two-dimensional surface of the canvas. 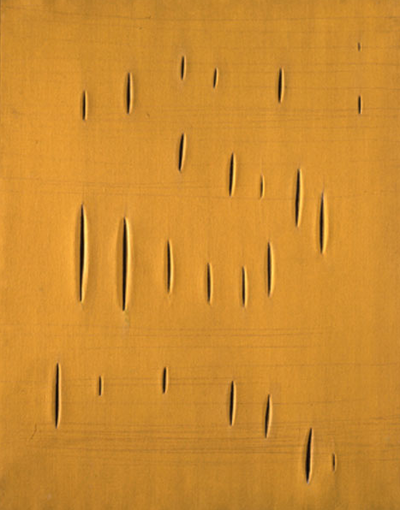 Lucio Fontana, Concetto Spaziale: Attese 61 T 59 (1961). The beauty of this exhibition allows viewers to celebrate Fontana's career, and life. 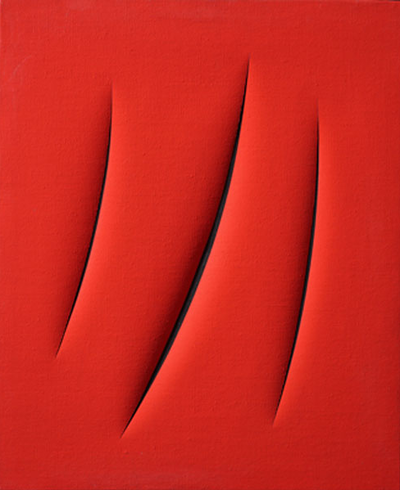 If viewers are left with any sense of regret, it is perhaps that Fontana spent his working life largely in Milan rather than Paris or New York, where he might have had a greater chance to influence the talented younger artists who were drawn to those artistic centers by the excitement of Tachisme and Abstract Expressionism. For whatever reason, Italy offered few potential students, as few ambitious and gifted young Italians dedicated themselves to artistic careers in the 1950s and '60s. As a result Fontana, like Giorgio Morandi, appears today as a relatively isolated master rather than as a leader of an important movement. This retrospective leaves no doubt that this was a great loss for the visual art of the past half century. 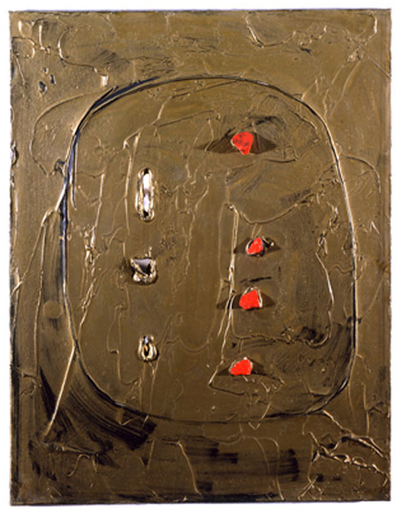 Lucio Fontana, Struttura al Neon (ca. ~1951).